There is an embedded constitutional and public interest in the impartial administration of justice. Court proceedings must be conducted transparently and be accessible to public and professional scrutiny, circumventing the opportunity for special treatment for selected litigants. To this end, normally court proceedings are held in public and are available for reporting. There are, however, important exceptions. Confidentiality is sometimes necessary in the interests of justice. The court may impose confidentiality to protect intellectual property, trade secrets or commercial confidences, or to prevent unnecessary disclosure of information amongst trade rivals. The public character of court proceedings should not be such as to deter access to the court to assert or defend a legal entitlement. Pre-action requirements are intended to promote the resolution or management of disputes before court or tribunal proceedings are commenced. This article explores the range of approaches applied in implementing pre-action requirements and provides examples of those that have been used recently in Australia. The main aim is to explore the operation and effectiveness of 2014 pre-action protocols that apply to medical negligence matters initiated in the District and Supreme Courts of South Australia. The findings are based on preliminary analyses of data collected during focus group interviews that were held with plaintiffs, defendants, lawyers and judicial officers as part of a research project being undertaken by the University of Newcastle and the University of Adelaide, designed to analyse the effectiveness of the protocols from cost, time, efficiency and fairness perspectives. The data suggests that, despite apparently widespread non-compliance, the protocols can have positive impacts and, when used appropriately, are fair. 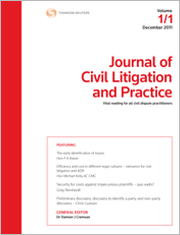 This article proposes a new case management tool to assist judges in ameliorating the adverse effect of litigant vulnerability in civil disputes. Many civil litigants have significant vulnerabilities, including self-representation, mental and physical illness, disability, technological incapacity, and linguistic and cultural difference. These vulnerabilities can adversely affect the ability of courts to manage their workloads and deliver justice to all litigants, particularly the most vulnerable litigants. This article explores the potential for practical non-legislative court reform to better accommodate litigant vulnerabilities through the introduction of an optional vulnerability assessment scheme. This scheme would inform judicial case management and facilitate litigant support to reduce party inequality and increase access to justice by ameliorating vulnerability and the inefficiency induced by vulnerability. Where a worker makes a claim for workers’ compensation, employers may resist the payment of compensation on the basis that they have a defence. This article concerns the preliminary processes by which disputes about liability are raised and determined in Australian jurisdictions, with a particular focus upon the procedure that applies in Tasmania. The article first introduces the substantive legal context of the procedures discussed, dispute systems concepts and terminology. The claims-making processes across all Australian jurisdictions are described and compared. The peculiarities of the Tasmanian system then become the main focus, with consideration of its purpose, process, and significance. We conclude that the interlocutory process in Tasmania is a significant end point for injured workers’ claims, despite the limited inquiry of a s 81A hearing. This raises questions about the justice of the workers’ compensation system within the context of psychological injury. For the PDF version of the table of contents, click here: JCivLP Vol 7 No 2 Contents.